A Swimming Pool is a place for swimming that is adjacent to your home. If you live in a single-family home, duplex or townhouse, then this will be located in your yard. But if you live in a condo, apartment or sometimes a townhouse, then the Swimming Pool will be a shared facility located within the overall housing complex. If your Swimming Pool also has a Hot Tub Spa associated with it, then you should also put a checkmark for 'Hot Tub Spa' to include this as part of your home features in your Home Wizard app. - Sanitizer levels (kills bacteria and helps control algae growth). - Water circulation and filtration (removes particulates and debris). - Regular brushing and vacuuming. Decking and Hot Tub Spa. 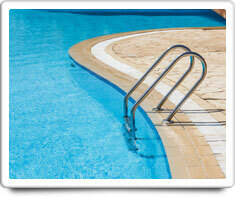 Shown in the 'Routine Care' section are the recommended routine maintenance tasks for your swimming pool. The 'Q & A' section shows answers to common questions. And the 'Articles' section provides helpful articles about your swimming pool.